Dr. Dennis Waring is founder and owner of Waring Music. Dr. Waring is an ethnomusicologist, educator, author, instrument maker, collector, performer, and arts consultant. He teaches World Music, American Music, and Music Education courses on the university level, and is involved in public education in primary, middle, and high schools. Upon receiving a Bachelor’s of Music Education from the University of Kansas (’67), he taught in public schools in Missouri, New Jersey, Vermont, and Manitoba, Canada. After earning his doctorate from Wesleyan University in Middletown, Connecticut (’87), Waring taught at Wesleyan, Brown University, Trinity College, University of Connecticut, and other regional state universities. As a Master Teaching Artist, he was honored as Connecticut State Troubadour for 2003 and 2004. His World Music Teacher Institutes often take him from coast to coast. Dr. Waring has taken two four month journeys around the world as shipboard ethnomusicologist with the University of Virginia’s Semester At Sea program and was even on MTV’s “Road Rules”! As a master instrument maker, Waring has written six books on musical instruments. He invents and manufactures instruments of all kinds. His instrument making workshops for people of all ages is a signature activity and his DVD “From Trash To Tunes” has garnered international recognition. Dr. Waring is comfortable with all styles of music. He is classically trained on the clarinet and studied with the great Italian maestro, Fredric Lubrani. As a traditional folk musician, he learned to play the Appalachian Dulcimer, Hammered Dulcimer, fiddle, Irish Drum and various wind instruments. During his tenure at Wesleyan University, Waring began to apply his multi-instrumental talents to a variety of world music stylistic interpretations and performed throughout the northeast with various music groups. One facet of Waring Music is ethnomusicology – the scholarly study of all the world’s musics, each within their social, historical, geographical, and cultural contexts. Scholars normally have specialties within the ethnomusicology continuum. In this regard, Dr. Waring possesses a broad based knowledge of world music, and is an authority on music of the USA, a specialist in areas of African and Latin American music, an organologist (the scholarly study of musical instruments), and an instrument maker. Dr. Waring is in a lineage that traces back to the pioneering anthropologists, Erich Von Hornbostel and Franz Boas (1858-1942). Boas’ interest in music as culture brought others such as George Herzog on board. George Herzog, in turn taught the late David McAllester (Wesleyan University Professor Emeritus of Anthropology and Ethnomusicology and a founder of the Society of Ethnomusicology). Dr. Waring was privileged to be one of the last doctoral students of Professor McAllester. Dr. Waring organized Waring Music as an educational organization involved with “applied ethnomusicology” through publishing, performing, teaching, composing, and providing access to resources for information, services, and products. Do you need a special music for a particular occasion? Would you like to speak to an authority to confer about an unusual instrument or to check out a bit of folklore? Do you need information about where to find ethnic instruments, quality recordings, or other educational media? Would you like to know where to attend a concert or festival of another country’s music? Waring Music can either answer your questions or help you find a source that will have the answer. Deep in the woods of Vermont, nestled amongst the conifers and maples, is a log house on a dirt road. This is where Dennis Waring runs his cottage industry, Waring Music. It’s a little hard to peg Dennis who is an ethnomusicologist, educator, musician, and instrument maker. He considers every day an adventure, no two days the same. During a week in his life, Dennis may find himself in a school gym- atorium entertaining 250 school kids with his show, From Trash To Tunes, an educational performance of handmade instruments built from recyclables: hosepipe flutes, bleach bottle banjos, scrap wood xylophones and such. Other days might find him pontificating at a university about cultural minutia, playing original music on his clarinet in one of his four Brattleboro bands, sitting on the floor playing African rock-passing games with preschoolers, or working in his shop inventing and manufacturing musical instruments. Author of six books, Dennis established himself as a professional instrument maker in Winnipeg, Manitoba Canada in the 1970s after which he earned a Ph.D. at Wesleyan University in Middletown, Connecticut. Throughout this time, he researched and built instruments ranging from Appalachian dulcimers, hammered dulcimers, harps, psalteries, drums and instrument kits to non- Western instruments like Chinese zithers, African percussion and ethnic flutes. He has taught American music, ethnomusicology and organology at Wesleyan and other universities, and inspired several of his students to pursue instrument making as a profession. As musical instrument companies began to get on the proverbial folk instrument bandwagon and manufacture assembly-line products, Waring was no longer able to compete economically— handmade instruments of high quality require extensive time and labor, making any sort of hourly wage generally untenable. Instead of going high-end to compete with a plethora of beautiful but expensive harps, Waring decided to go low-end, making functional, entry-level harps. In that regard, his so-called “cardboard harp” has caught on—furthering his mission as an educator to make learning music more accessible and affordable for everyone. Waring says that generally his harps are for youngsters and adult beginners but are often used by harp teachers’ classes, for professionals working in music therapy, hospice, and the healing arts. Reports from accomplished harp players confess that for fun, informal, creative sessions, they tend to pick up the Waring Harp instead of their performance instrument. On a personal level, I am an owner of a Waring Harp and a Registered Expressive Arts Therapist, Educator and Consultant with the International Expressive Arts Therapy Association. For seven years, I worked for a hospice program in Connecticut as an Expressive Arts Specialist visiting terminally ill patients and their families to help them express their feelings through visual arts, poetry, puppetry, storytelling and music. The Waring Harp was one of my best musical tools. 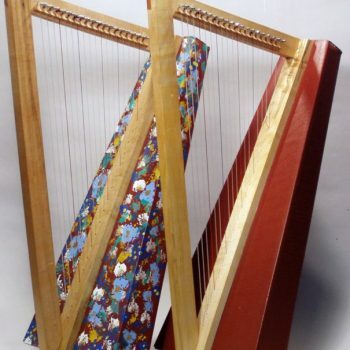 As I traveled through nursing facilities, private family homes and hospitals, the harp helped patients to relax. If they weren’t lulled to sleep while I played, patients made comments like “The sound of this harp brings me peace.” There were times when patients asked if they could play the harp, and the answer was always “yes.” The harp was light enough to place on their lap without being too bulky or unwieldy. 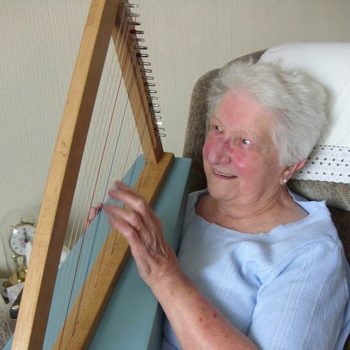 Patients were usually left smiling after the experience of making their own music on the harp. Waring Harps are now used in teachers’ classrooms and musicians’ studios for beginner harp classes and workshops in dozens of countries worldwide. For example, England’s Cumbria Cardboard Harp Project organized by Mary Dunsford, began by building ten Waring Harps. A very enthusiastic teacher and player, Mary provides introductory group lessons for youngsters with instruments that are not only affordable but good for the environment . . . made from sustainable materials, plus all ten harps fit into one vehicle! 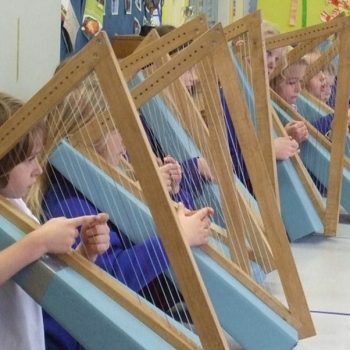 Dunsford attests that the instruments provide a perfect access point for learning the basics of the harp and an opportunity for pupils of all ages to participate in a group environment, sharing the experience and gaining valuable skills from playing alongside others. For a look at this wonderful project, go to Mary Dunsford’s website at MaryDunsford.am55.co.uk/cardboard-harp-project. Additionally, two method books are written specifically for the Waring Harp, the Waring Harp Primer and Music Just For This Harp. The instructions and music were carefully chosen and arranged by Canadian harpists, educators and performers Esme’ Boone and Jean Robinson. Boone is one of several harpists who continually organize Waring Harp workshops with groups of adult students who build their harps together and then learn to play. And because the harps are do-it-yourself kits, participants decorate them to their own taste. Their response to this option is wonderful to behold! Players send pictures to Waring Music of finished ornamented harps that are worthy of a gallery exhibition. In the words of Jakez Francois, President of Camac Harps, “Your incredible ‘cardboard’ harp offers a great sounding, clever, light and affordable design that democratizes the harp to a greater public.” Dennis’ goal has been met. 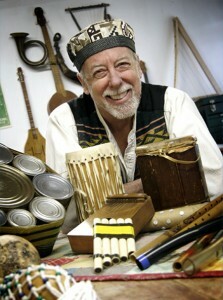 To find out more about Dennis Waring, his programs, books and musical instruments, go to WaringMusic.com.